Pho­tog­ra­phy pod­cast #33 talks about set­ting up a begin­ner pho­tog­ra­phy por­trait stu­dio. In this pod­cast we dis­cuss using dif­fer­ent types of flash sys­tems as great choices for in stu­dio por­traits. We talk about using small portable flashes, pack and head sys­tems and monoblock flash heads. 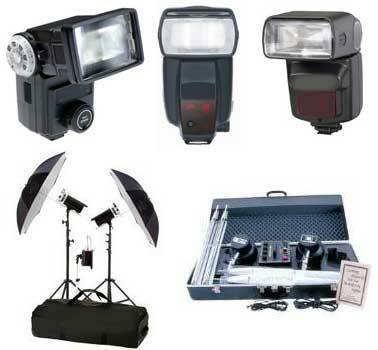 We also touch on the acces­sories that you’ll need includ­ing a flash meter, umbrel­las, slaves, pc cords etc. Although the empha­sis is on inex­pen­sive stu­dio setups, any of these setups are likely to serve both tra­di­tional and dig­i­tal pho­tog­ra­phers very well for years to come. Due to the length of this pod­cast we’ll skip photo of the week this time around. Thanks as always for com­ments by Al, on our last pod­cast on Mul­ti­ple expo­sure in pho­tog­ra­phy and thanks very much to Sami­rah of our pho­tog­ra­phy forum for her sug­ges­tion that inspired this par­tic­u­lar pod­cast. We LOVE com­ments and sug­ges­tions so please send more. You can down­load this pho­tog­ra­phy pod­cast directly by click­ing first link or lis­ten to it almost imme­di­ately with the embed­ded player below the pho­tographs. Thanks for all the advice! I love learn­ing more about pho­tog­ra­phy and I found this pod­cast to be full of great infor­ma­tion. Do you plan to do more pod­casts with more advanced lessons? Thanks got the great tips. I’m a teacher in NYC set­ting up my first stu­dio for an after school pro­gram. Your insights on gear were tremen­dously use­ful. Look­ing for­ward to lis­ten­ing to more. Thanks. Appre­ci­ate that Jim! Good luck! I just stum­bled on this post/podcast just now and I’m glad I did. I’m not a def­i­nite begin­ner as far as begin­ning pho­tog­ra­phers go, but I appre­ci­ated the advice, nonethe­less. Even though much of it was a review of sorts, I was reminded of a few things that I need to pay more atten­tion to and work on. Thanks! Thx for the com­ment pho­tog­ra­phy. I 100% dis­agree, but i appre­ci­ate the comment. Every­thing i men­tioned in this 2.5 year old pod­cast is STILL very valid for beginners. Those pho­tog­ra­phy equip­ments seem pretty good but they also seem a lit­tle out dated. Pho­tog­ra­phy is a great thing. Every­one needs a pho­tog­ra­pher for spe­cial times like wed­dings, fam­ily ex. Its a great thing to have. bril­liant advice, really help­ful for begin­ners, Good job keep it up. Fisrt time lis­tener and I enjoyed this advice. Looks like there’s some inter­est­ing top­ics I’ll have to check out. Good Job so far!